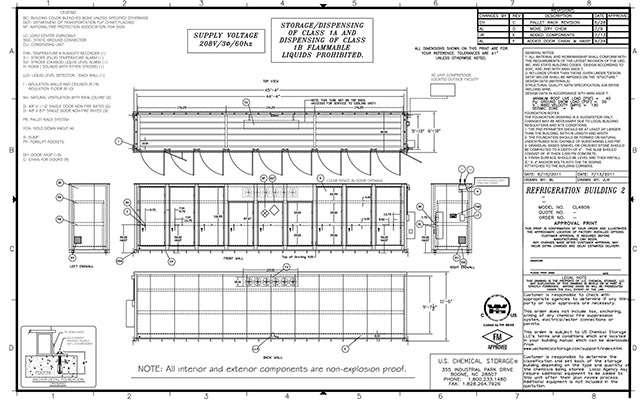 Our Explosion Relief Construction consists of blow out panels that are required by NFPA 68 to compliantly store Class 1A Flammables. Explosion Relief Panels are designed to vent an explosive force should an accident occur. U.S. Chemical Storage Explosion Relief Panels will protect your inventory and give you the confidence of taking on less risk. As a general rule, a buildup of vapors from Class 1A and 1B flammables brings the risk of an explosion. Our Explosion Relief Panels are designed to vent an explosive force, should an accident occur that causes a high internal pressure within the storage structure. If gas pressure rises, our Explosion Relief Panel will open quickly allowing the heat and gas to be released outside. Our Explosion Relief Panel is designed to react quickly at an internal pressure of 20 psf. Through the venting of this pressure via the explosion relief panels, you can help to minimize damages. The panels, with FM Approved release fasteners, meet ASTM-D35, ASTM-E84, ASTM-E-283 & FM Approval Standard Class Number 6049. Using Explosion Relief Panels in fire rated and non-fire rated buildings allows for extra protection against damages when storing highly combustible materials, such as Class 1A. Any situation that includes handling, storing or processing of flammable gases, liquids or solids carries the risk of an ignition and our Explosion Relief Panels are designed to minimize damage to inventory. It is your option to choose which type of Explosion Relief Panel you want for your building: Bottom or top hinged Explosion Relief Panels. Buildings use both types of panels and some only use one primary panel. Top hinged panels will close once the internal pressure has been relieved. Top hinged also allows protection from wind, rain, snow and other weathering. Furthermore, top hinged only permits for explosions to blast downwards, reducing the effects of hazard. Customize your U.S. Chemical Storage building with superior explosion relief construction for maximum safety when storing your combustible materials. With our Explosion Relief Panels, your U.S. Chemical Storage building is designed to resist a minimum internal pressure of 100 psf. Pressure relief panels are located on the exterior wall and are designed to release at an internal pressure of 20 psf. Each panel is equipped with release fasteners and a restraint mechanism designed to cushion the panel’s acceleration as the full open-position is reached. Our Explosion Relief Panel meets the NFPA 68 Standard on Explosion Protection by Deflagration Venting, for unmatched protection for your personnel and equipment. When storing your combustible materials, our Explosion Relief Panel will provide extra protection against damages caused by potential explosions. Your building is designed to resist a minimum internal pressure of 100 psf. Pressure relief panels are located on the exterior wall and are designed to release at an internal pressure of 20 psf. Each panel is equipped with release fasteners and a restraint mechanism designed to cushion the panel’s acceleration as the full open position is reached. Our Explosion Relief Panel meets the NFPA 68 Standard on Explosion Protection by Deflagration Venting. This Explosion Relief Panel is coated with paint and features stainless steel hardware. For enhanced safety, protect your equipment and your personnel in the event of an explosion with our Explosion Relief Panel. When storing your combustible and explosive materials, safety is a priority. Our Explosion Relief Panel will provide additional security for the safety of your personnel. Pressure relief panels located in the roof of your U.S. Chemical Storage building will release at an internal pressure of 20 psf. This panel features an explosion relief vent with a prefab aluminum curb and .050” aluminum panel retainer frame. Panels will be 2” insulated semi-rigid fiberglass core, double wall. Open vent area is 1 square foot per 16 cubic feet of interior volume. Each panel is equipped with release fasteners and a restraint mechanism designed to cushion the panel acceleration as the full open position is reached. Maintain a safe environment for your equipment and your personnel with our Explosion Relief Panel. 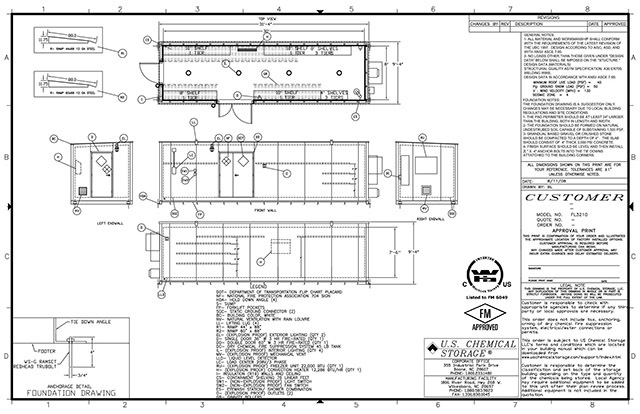 When designing your U.S. Chemical Storage building for your combustible and explosive materials, our Explosion Relief Panel will provide enhanced safety for you and your personnel. Pressure relief panels located on the roof of your U.S. Chemical Storage building will release at an internal pressure of 20 psf. This Explosion Relief Panel comes equipped with a relief vent with prefab aluminum curb and .050” aluminum panel retainer frame. 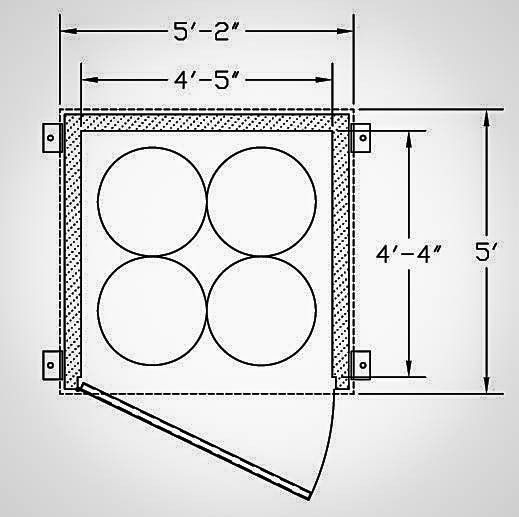 Our Explosion Relief Panels are 2” insulated semi-rigid fiberglass core, double wall for exceptional durability. Each panel is equipped with Factory Mutual-approved fasteners and a restraint mechanism design to cushion the panel acceleration as the full open position is reached. Maintain a safe environment for your equipment and your personnel; provide them with unmatched protection with our Explosion Relief Panel. For unbeatable protection when storing your combustible materials, try our Explosion Relief Panel. Designed for superior durability and performance, our Explosion Relief Panel safeguards your equipment and your personnel in the event of an explosion within your U.S. Chemical Storage Building. Your pressure relief panels will be located in the roof of your U.S. Chemical Storage building to release at an internal pressure of 20 psf. Our Explosion Relief Panels feature an explosion relief vent with a prefab aluminum curb and .050” aluminum panel retainer frame. Each panel is equipped with Factory Mutual-approved release fasteners and a restraint mechanism design to cushion the panel acceleration as the full open position is reached. Protect your equipment and your personnel with our exceptionally durable Explosion Relief Panel. Explosion Relief Panel- 4'-0" x 4'-0"
Our Explosion Relief Panel will provide superior protection for your personnel and equipment in the event of an explosion. Class IA and IB flammables are capable of vapor buildup that may lead to an explosion. With this Explosion Relief Panel, your U.S. Chemical Storage building will resist a minimum internal pressure of 217 psf. Pressure-relief panels are located on the exterior wall and are designed to release at an internal pressure of 20 psf. Each panel is equipped with approved release fasteners and a restraint mechanism designed to cushion the panel’s acceleration as the full open position is reached. Our Explosion Relief Panel meets NFPA 68 7.1.3 Standard on Explosion Protection by Deflagration Venting, for your maximum protection, should an explosion occur. Safeguard your personnel and equipment with our exceptionally durable, safe Explosion Relief Panel. 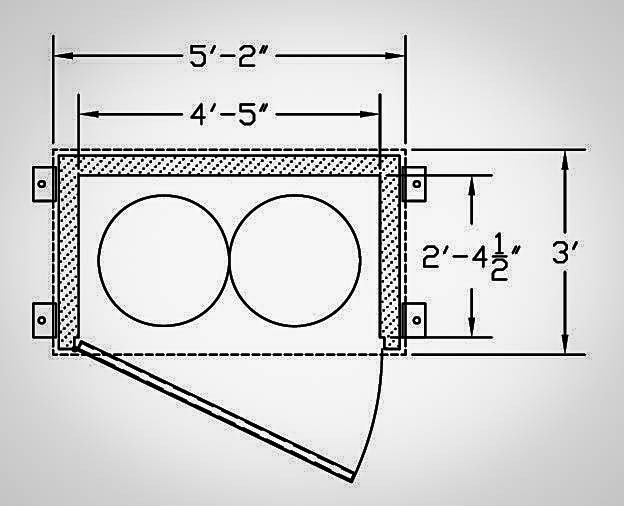 Explosion Relief Panel- 4'-0" x 5'-0"
For ultimate protection for your personnel in the event of an explosion, we offer an Explosion Relief Panel for our fire rated or non-fire rated buildings. With this Explosion Relief Panel, your building is designed to resist a minimum internal pressure of 217 psf. Pressure-relief panels are located on the exterior wall and are designed to release at an internal pressure of 20 psf. Each panel is equipped with approved release fasteners and a restraint mechanism designed to cushion the panel’s acceleration as the full open position is reached. 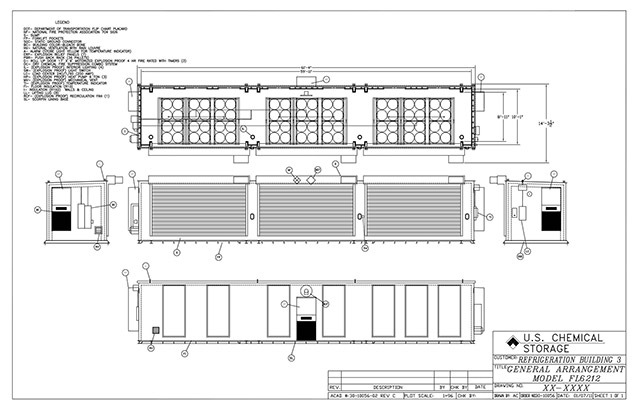 This Explosion Relief Panel meets Approval Standard FM 6049 for Flammable Liquid Storage Buildings. For your chemical storage needs, our Explosion Relief Panel will offer increased security as a precaution against damages caused by an explosion. Equip your U.S. Chemical Storage building with our Explosion Relief Panel for maximum safety for your equipment and your personnel. 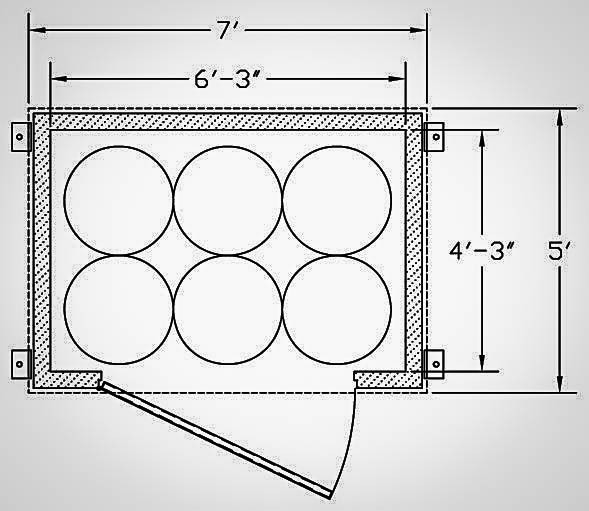 Explosion Relief Panel- 4'-0" x 6'-0"
When storing combustible or explosive material, you need an Explosion Relief Panel. This panel is designed for your U.S. Chemical Storage building to safeguard the area around your building in the event of an explosion, minimizing the damages to your property, as well as to your personnel. With this Explosion Relief Panel, your building designed to resist a minimum internal pressure of 217 psf. Pressure-relief panels are located on the exterior wall and are designed to release at an internal pressure of 20 psf. Each panel is equipped with approved release fasteners and a restraint mechanism designed to cushion the panel acceleration as the full open position is reached. 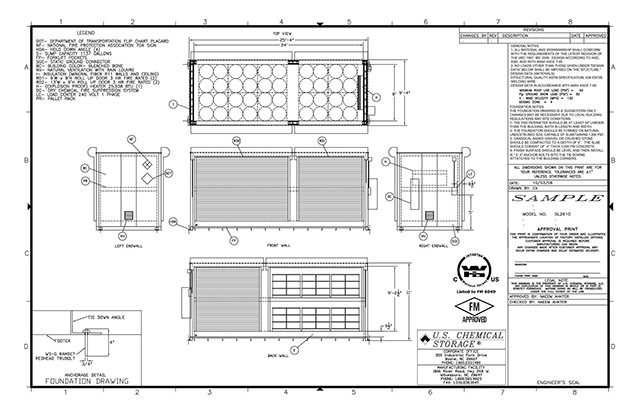 This Explosion Relief Panel meets FM 6049 Approval Standard for Flammable Liquid Storage Buildings. Protect your assets and your personnel with the highest standard of safety with our Explosion Relief Panel. 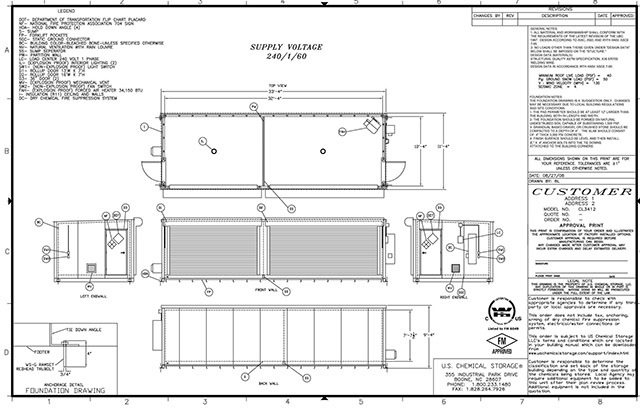 Explosion Relief Panel- 4'-0" x 7'-0"
At U.S. Chemical Storage, your safety is our priority. 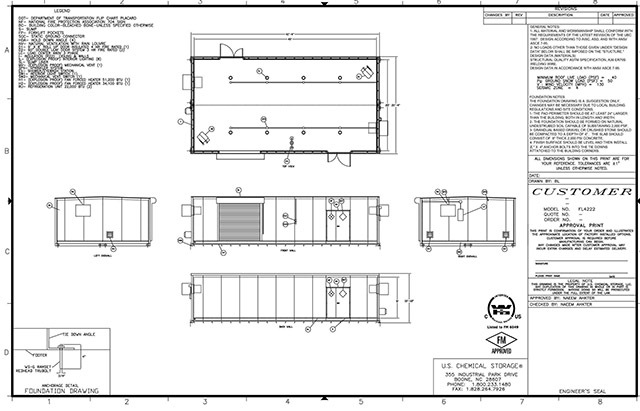 That is why we offer an Explosion Relief Panel for your storage buildings. In situations that require the handling, storing, or processing of flammable materials, ignition is a risk. Designed to resist a minimum internal pressure of 217 psf, this Explosion Relief Panel is the key to enhanced protection for your personnel. Each panel is equipped with approved release fasteners and a restraint mechanism designed to cushion the panel’s acceleration as the full open position is reached. 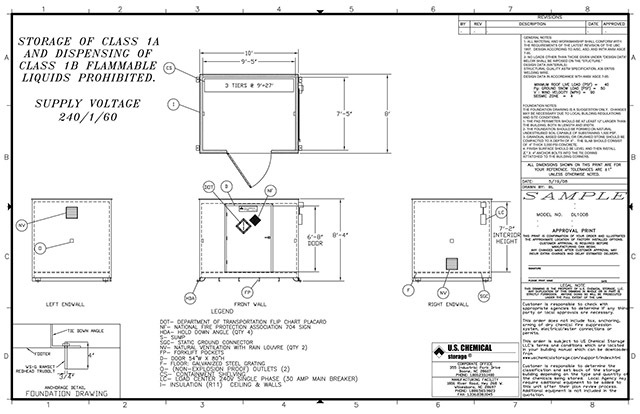 This Explosion Relief Panel meets the FM 6049 Approval Standard for Flammable Liquid Storage Buildings. We aim for the highest standards of safety in order to safeguard your personnel and your inventory, with superior durability and reliability for your peace of mind. Our Explosion Relief Panel provides unmatched safety in explosion relief construction. When storing your combustible and explosive materials, our Explosion Relief Panel can provide you with enhanced protection against damages caused by chemical explosions. This Explosion Relief Panel will be located in the roof of your U.S. Chemical Storage building to release at an internal pressure of 20 psf. This Panel features an explosion relief vent with prefab aluminum curb and .050” aluminum panel retainer frame. The panel is 2 inches, insulated semi-rigid fiberglass core, double wall. 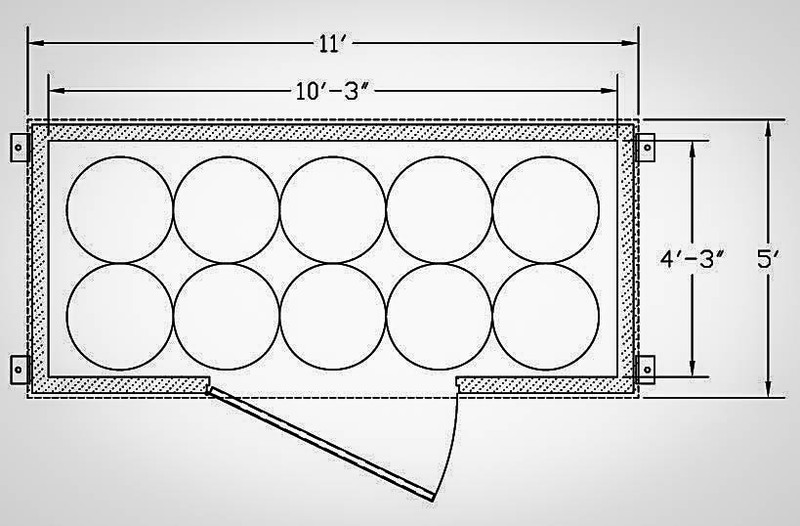 The open vent area is 1 square foot per 16 cubic feet of interior volume. Each panel is equipped with release fasteners and a restraint mechanism design to cushion the panel acceleration as the full open position is reached. Our Panels are designed for the maximum safety of your personnel, bringing you the highest quality, most reliable product in the industry. For the storage of explosive materials, an Explosion Relief Panel can mitigate dangers, protecting your personnel and your facility against damages caused by explosions. This Pressure Relief Panel will be located on the exterior wall. It is designed to release at an internal pressure of 20 psf. Our Explosion Relief Panel is equipped with release fasteners, and a hinge at the bottom to keep the Panel tethered to the building in the event of deployment. This Explosion Relief Panel meets ASTM Standards D35, E84, and E283, guaranteeing you the best-quality product that meets the highest standards of safety. A blast shaft is installed on the exterior wall over panel opening, manufactured from a tube steel frame and covered with heavy gauge steel. 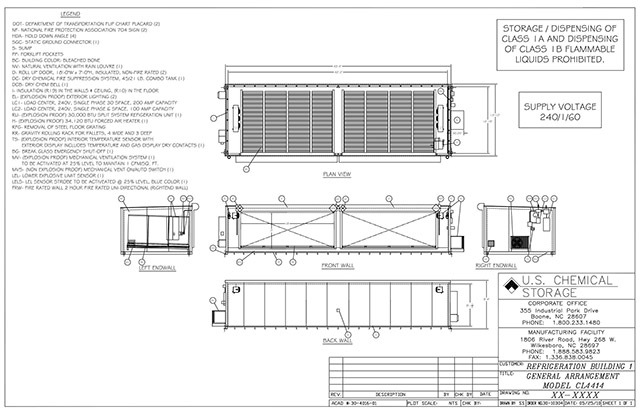 The blast shaft is designed to direct the explosive pressure up in the vertical direction, further safeguarding your personnel in the event of an explosion within your U.S. Chemical Storage building.